Tina's Crop Shop: Growing in Unity - Comfort to Go! OoooH, I love this! Can you believe I DO NOT have this stamp yet?? Thanks so much! It is such a great stamp set! OMGosh that is a beautiful card; I love the colors you used.. That is one of my favorite stamp. Thanks so much Traci! I love all stamps that are coffee related and this is certainly one of my favorites too! Oh WOW! that is stunning! How sweet! Thanks so much Glennis! This stamp set really does all of the work for you. Very cute card, love the ease of creating these fabulously festive cards! Thank you Joyce! I agree! This is such an awesome stamp set and makes it super easy to create a cool card! So beautiful!!! And it’s my favorite color!! I have this gorgeous stamp and love it! Thanks for the inspiration! Thanks Crystal! This is such a great stamp set! Turquoise and/or teal is my favorite color too! Great minds think alike! Lovely,beautiful,colorful card.It's so special and creative. Love the colors you used! The turquoise is so pretty with the b&w! Thanks so much! I love turquoise and I'm glad you thought it worked. So do I! It's one of my favorites! Thanks my friend! It's an awesome stamp! Of course I love all things coffee! Thanks so much Georgia! I sure love my coffee. I can't imagine life without it. Sad, right? I just ordered this stamp, so I love seeing this great card. Adding a seed bead to the sequins is a great idea and makes them look more finished. Thanks so much Denise! I appreciate you stopping by and taking the time to comment! Love the turquoise !!! one of my favorite card colors. Thanks Katy! Turquoise is my favorite color! I love the 'to go' coffee cup series! I still need this one, tho. Your card is gorgeous and I agree, it would look awesome in any color. Thanks so much Rebecca! I have most all of the to go coffee cups too.. I need to check out which ones I'm missing! Like the card a lot, great idea for my coffee friends. Love this and believe it or not, I have the other sets of coffee cups, but not this one! LOL. Love your colors too. Thanks for sharing your talents! What a pretty and tranquil card. I love the wintery look it has, perfect for this time of the year! Thanks so much Beth! I appreciate you stopping by and taking the time to comment! Thanks so much Judy! I love coffee on a cold day.. well I love it on a hot day or just about any day but it does warm you up when it's cold. Very colorful card. Love the way you used snowflakes as the background. So simple and pretty. Nice look. What a pretty card; I love your plan of "threes"
Lovely card! I really like the blue!!! 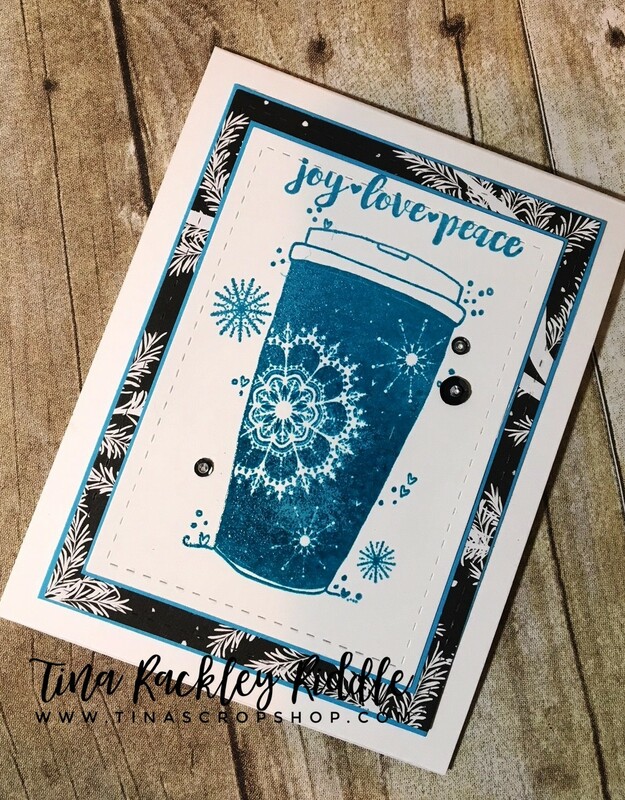 I love all the layers to your card!!!. Very pretty. Pretty card. I like the layers and the turquoise. Wonderful card! The thin layer of turquoise behind the layers is just the thing! Really nice design element! The color is great! I like to do "odds" also..... 3's, 5's, etc. The little pops of turquoise papers rally set this off beautifully! Perfect. I love the solid color stamping with the matching matte. Just lovely! Gorgeous teal ink! I like your idea of repeating a color 3 times. This is such a beautiful stamp! I love this set! I don’t drink coffee. Crazy, I know. I love all the creations with these coffe stamps. I must be missing out. The thin edge of turquoise paper really sets off the inked image. Beautiful! I like the coffe cup stamp with a heart, but this may have become my favorite! I love the idea of repeating colors 3x. It really makes your card pop.